Don’t be limited by your interface’s connectivity. 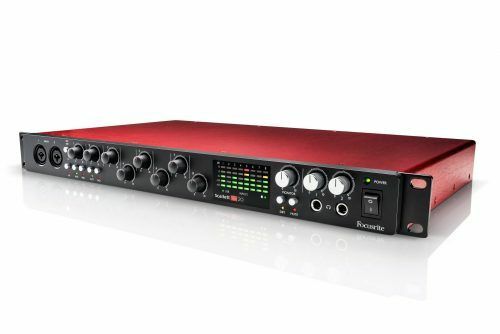 Focusrite’s latest generation 18-in, 20-out USB audio interface can handle just about anything your band/studio can throw at it. Beautiful and rack mountable, it gives you loads of I/O, pristine sound quality, separate stereo headphone mixes, extensive expansion options and round-trip latency as low as 2.74ms*, all in a 1U space. 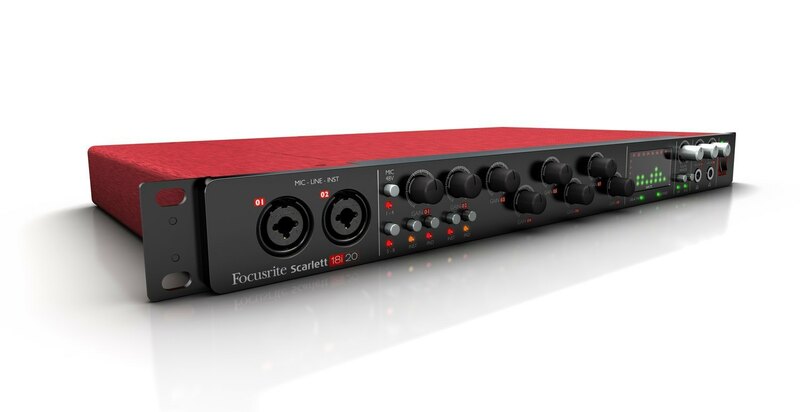 Focusrite interfaces are perfect partners for Pro Tools, so Scarlett 18i20 comes with Pro Tools | First Focusrite Creative Pack. as well as Ableton Live Lite recording software and a suite of software and samples. So you can start recording straight away. Scarlett 18i20 works flawlessly with all major DAWs on Mac and PC, and they continue to work with Avid to ensure it is compatible with every update to Pro Tools. Scarlett 2nd Generation interfaces have lower latency than any other USB audio interfaces. The 18i20 puts eight natural-sounding combination inputs at your disposal. They put two on the front, where you need them most. Newly designed instrument inputs that can handle even the hottest signals. They put six more on the back, so you can leave your mics, synths, keyboards, mixers and effects processors permanently plugged in and ready to go. If that isn’t enough for you, connect an eight-channel mic pre like the Scarlett OctoPre to the ADAT input for a total of 16 analogue inputs. Add the two channels of digital audio via S/PDIF and 16 channels of MIDI. You can record just about anything you want. Need additional mic preamps for your Scarlett interface? We have just the answer: an OctoPre. Choose between the eight-input Scarlett OctoPre and the deluxe features of the Scarlett OctoPre Dynamic. Both include eight 2nd Generation Scarlett mic preamps and up to 192kHz A-D precision conversion. The Scarlett OctoPre Dynamic adds analogue compression to every channel. All this plus eight channels of D-A providing you with an additional eight outputs in your studio. The Scarlett OctoPre lets you expand your interface immediately – providing you with more inputs.